MONTREAL -- Montreal Canadiens general manager Pierre Gauthier announced Friday that the Club agreed to a three-year contract (2010-11 to 2012-13) with centreman Gabriel Dumont. As per Club policy, financial terms of the agreement were not disclosed. Dumont joined the Hamilton Bulldogs earlier today. A native of Dégelis, Québec, Dumont played in 62 of the Drummondville Voltigeurs (Quebec Major Junior Hockey League) 68 regular-season games in 2000-10. He ranked third in the QMJHL with 93 points (a league-leading 51 goals, and 42 assists). Dumont ranked fifth in the QMJHL with 16 power play goals, also scoring twice on the penalty kill and recording nine winning goals. He also served 127 penalty minutes and maintained a +43 plus/minus differential. 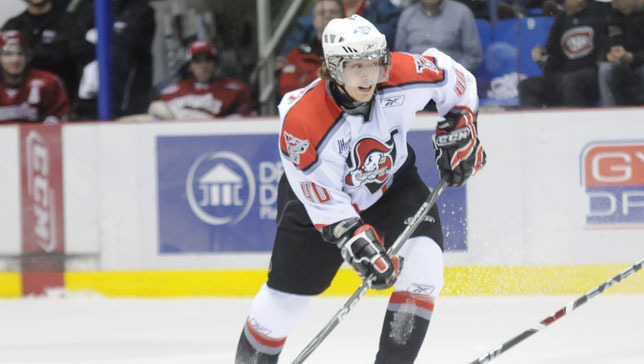 The 5’10’’ and 181 lbs centreman won the 2009 QMJHL Championship with the Drummondville Voltigeurs, representing the League at the Memorial Cup Tournament. In four seasons in the QMJHL, Dumont recorded 169 points (91 goals, 78 assists), 299 penalty minutes and a +40 plus/minus rating, in 180 games. He tallied 24 goals on the power play, six on the penalty kill along with 12 winning goals. Selected in the fifth round, 139th overall by Montreal in the 2009 NHL Entry Draft, Dumont was invited to the Canadiens’ development camp last July as well as to the club’s rookie camp.